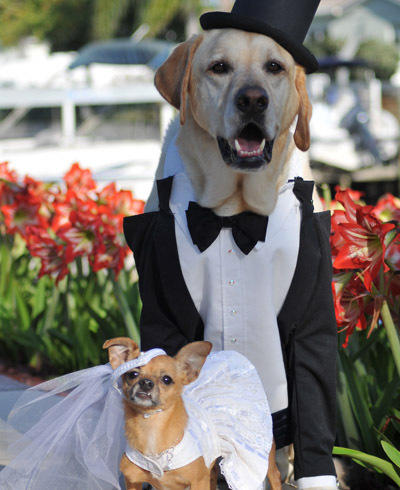 Planning on having your beloved pooch in your wedding party? If so, you may be interested making a donation to the ASPCA in lieu of a traditional wedding favor. They will provide you with custom ASPCA place cards which will let your guests know a donation has been made in their honor. For more information, visit their website or call (212) 876-7700, ext. 4516. Just like the ASPCA, many other organizations allow you to make a donation in honor of your guests. TheKnot.com makes it super easy to pick a charity and order personalized place cards for a nominal fee (about $15-35 depending on the size of your wedding, plus the actual donation). You can pick a specific charity from one of 6 categories: Children & Families, Community Development, Education, Environment, Health, and Social Justice. I’ve also found some great ideas on Etsy, including many green ideas from Nature Favors. 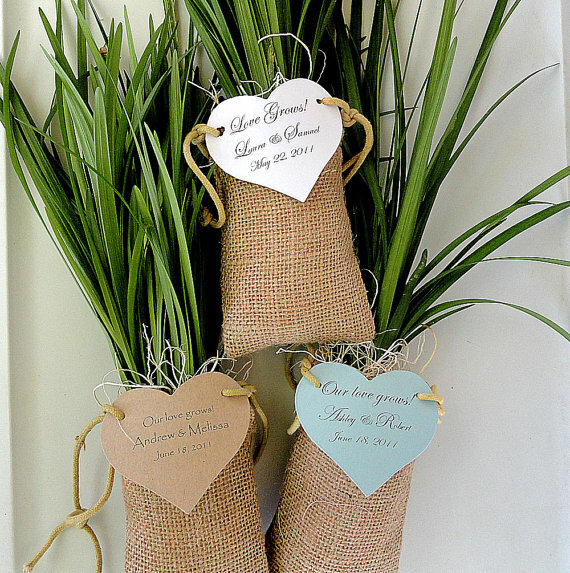 These cute heart-shaped bird seed favors would look great on tables set in a vineyard wedding, or a backyard bridal shower. You can hang them at the party as decorations and/or let your guests take them home; either way, the favor will feed some birds and reduce waste. From the same vendor these lilly grass plants (pictured) are perfect for spring affairs while these plantable leaf confetti garden favors scream fall. Don’t Trash the Dress-Donate it! BRIDES: Brides Against Breast Cancer will take your dress and re-sell it at a significantly discounted price during their nationwide “Tour of Gowns” events across the country, with proceeds going towards granting the wishes of terminal cancer patients. BRIDESMAIDS: DonateMyDress.org provides a national listing of local dress drive organizations who take donated special occasion dresses and give them to those who cannot afford them for prom, sweet 16, quinceañera or formals. In New York, you’ll find the WGIRLS NYC Chapter in Manhattan and L.A.C.E. in Brooklyn. BRIDES & BRIDES-TO-BE: The Bridal Garden in Midtown Manhattan is the city’s only not-for-profit bridal boutique showcasing stunning designer and couture wedding gowns at up to 75% off retail prices. You can buy your dress here or donate the one you got elsewhere; either way, all proceeds will benefit education for NYC children. After the party is over, you may find yourself slipping away into the sunset to a faraway land or sleeping soundly for the -a’hem- ‘first’ time with your new spouse. Meanwhile, all of those super expensive flowers, delicious food leftovers, and other stuff that once seemed like life or death decisions will be heading out to pasture, only to become a distant memory seen on Facebook and your coffee table for years to come. Why not let someone else enjoy the spoils after you’re gone? – Call local nursing homes or hospitals near your venue and see if they would like to receive your centerpiece flowers after the wedding. Arrange a drop-off via a friend or family member, and let it be their gift to you. – Instead of a traditional sign-in book, have guests fill out cards to troops overseas, wishing them well and a speedy and safe return home. 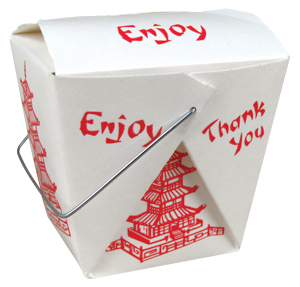 Provide a decorative box for them to be placed into. – Too many leftover favors to count? Depending on the item, they may be useful to a Salvation Army store for resale. Or maybe you know of a local non-profit who is planning a fundraiser; let them use your leftover favors to save on costs of buying their own. – The I Do Foundation has even more tools that will allow you to give back to charity, including gift registries, green ideas and more. Visit their website for more info! Do you have other ideas? Have you done any of the above successfully (or unsuccessfully)? Sound off below! Great Post. Soooo Many great ideas! I am going to tell my bridesmaids to check out Donatemydress.org!!! !